Post-graduation life is just not the same. No more midday naps nor staying up all night with friends. These days I’m glad if I make it to happy hour and back in time for a good night’s sleep. I used to make fun of a recently-graduated friend of mine by calling him abuelito (grandpa in Spanish) because he would go to bed at a reasonable hour. I’m sure this is karma’s way of poking fun at me. One thing I don’t skimp on though, despite my lack of time, is the food I eat during the week. Instead of procrastinating on the blog some more, I thought I would write about a typical workweek meal and throw in some of my cooking mantras, too. First of all, I really do mise en place for every meal. Even if I prep all my ingredients on the same cutting board to avoid a sink full of dirty dishes, I do mise en place. Why? Mostly out of habit, but also because it makes the actual cooking process more enjoyable and less stressful. Trust me, nothing is worse than being in the middle of cooking a wonderful meal and realizing you added salt to bananas foster instead of sugar. It’s even worse to try to fix the horrible mistake by adding tons of sugar to an already ruined bananas foster. It’s happened to me. So, yes, prep all your ingredients beforehand. Last week I discovered a bunch of overly ripe figs in my fridge that I had purchased at the farmer’s market a couple weeks prior. As you can tell by their wrinkly appearance, they were beyond sweet and perfect to contrast against something salty, say, like blue cheese. I don’t believe food needs to be complicated in order to taste great. Food needs to be balanced and well seasoned. The flavors need to strike that perfect note in your mouth. 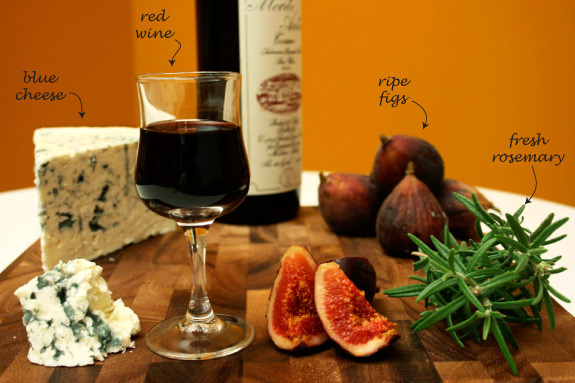 Figs, rosemary, and blue cheese are three ingredients that form one of the classic culinary chords. 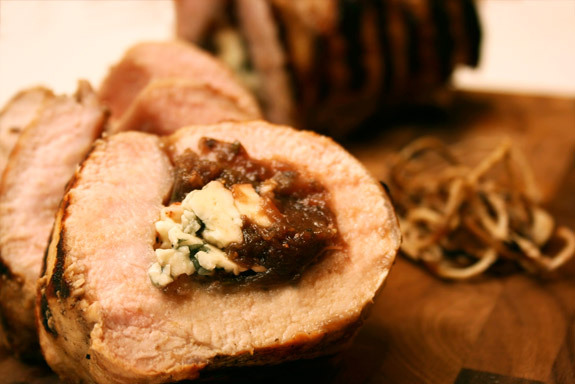 I paired these ingredients into a homemade fig jam and used it as a stuffing for a delicious butterflied pork loin. For this dish, I threw some figs, rosemary and red wine in a small sauce pan and let it cook down for almost an hour. You don’t have to stand over your pot while the sauce reduces for an hour. I let the sauce do its thing and in the mean time I do other things: snack in the kitchen, pour a glass of wine, and unwind. Never skip a good sear. Not only will it give the meat a head start before going into the oven, but it forms a nice crust that protects the meat from drying out on you. Sear the meat on all sides over the highest heat possible. Then it goes into a 400 degree oven until the meat reaches 160-170 degrees F or is opaque throughout and juices have a faint blush. This meal lasted me for a few lunches at work. I alternated it with sides of wild rice, garlic roasted potatoes, and mashed potatoes to keep my lunches interesting. In a small saucepan coated with olive oil, sweat the shallot and the garlic until translucent. 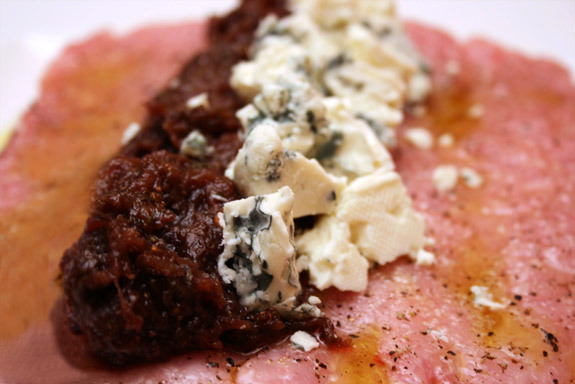 Season the butterflied pork loin and line with fig paste and crumbled blue cheese. Tie the loin around the filling and sear on all sides. Finish cooking the loin in a 400 degree oven until it has reached 160-170 degrees F or the meat is opaque throughout and the juices are have a slight blush. Allow the meat to rest for 7-10 minutes covered by a sheet of aluminum foil before slicing. notes: You can use dried figs and cook the fig paste for less time (this is what I most often do, in fact). 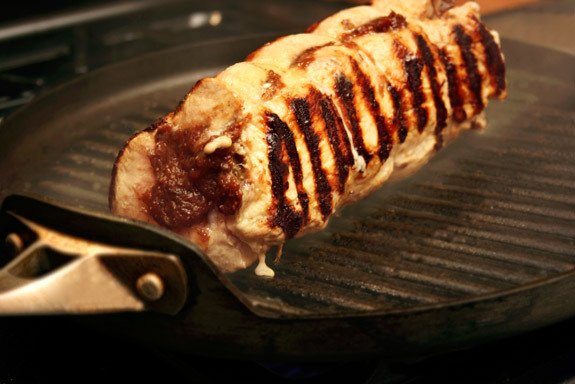 Depending on the thickness of your meat, the cooking time will vary. Mine finished in the oven after 15 minutes, but a thermometer or the color of the meat is the best way to gauge proper doneness. Posted in French, Italian, recipe, savory by Antonio Tahhan on October 5th, 2008. You can follow any responses to this entry through the RSS 2.0 feed. You can leave a response, or trackback from your own site. It took me quite a while to get used to post-grad working life but it gets better. As long as you are smart enough to make yourself delicious, homemade lunches like this, you’ll do just fine. I find now that I look forward to, and enjoy, weekends much more than I ever did before. Hang in there…you’re just experiencing the transition to a more balanced lifestyle with many satisfying components, including occasional nights in. But, whatever your time and energy constraints, don’t give up blogging. Your blog is so beautifully designed, it’s a pleasure for me to stop by with each new post. Wow, that looks awesome! Great use for overripe figs, and you get extra meals from it to boot. I’m lucky to work swing shift, so I do have personal time at the beginning of my day when I’m fresh and can enjoy it. If I worked days, I would try to be an earlier riser so I could still do that. At night it is hard to feel ambitious about anything, even cooking, after a long day. Tony, you were busy but ya came back swinging with a fine fall dish…I’ll get some more(hiccup) – wine. I definitely remember those initial transition days. In fact, I still miss the flexible schedule sometimes. Where I went to school we took one class at a time for a month and then got a week off in between classes. Talk about a schedule to adjust from! No more week vacations every month! All the same, I agree with Joan re: great nights in. I love reading your blog (and seeing it). I hope the balance strikes for you and you can keep it up! It is just a transition, cuz after a while you get used to waking up so darn early 5 days of the week yet at the same time you are able to sleep late and wake up at early! I’m an abuelita already and nearly forgot all those crazy nights…nearly! Heavy T, as long as the word gym is up there, you receive the blogging excuse from me 🙂 No worries, just keep doing what you’re doing bud. While I don’t have a real job yet, I’m in grad school too technically, and I figure we’re about the same age. Call me an old pants, but I like going to bed at 11pm and getting up at 7. I dunno, the long nights thing doesn’t do it for me anymore. What does do it though, is roasted stuffed pork. The meat is lean, mean, and flavorful. Awesome j-o-b. Looks great. I have some figs getting old in the fridge that I’ve been wondering what to do with. Do you think using feta cheese would work as well? I love HOUSE too – and also Grey’s Anatomy!! OK that out of the way allow me to drool – this is simply lovely. I am into pears and blue cheese so I can only imagine the fig and blue cheese dreamy combination. So when I’m over I’ll bring the wine you cook this up and we can get cozy with HOUSE! Sound good? Mmmmmmm. I aspire to lunch like you do! WWTE: What would Tony eat? Katie, that is quite the midnight meal!! Port is fantastic and if you love those types of flavors, I think this would be right up your alley 🙂 Hopefully I’ll have a couple years to adjust before the kids make an appearance. Robin, weekends are my new weekly treasures!! Thanks, Joan! Hearing back from bloggers is my motivation to keep going and I always appreciate all the comments. I’m glad this is just the transition… I’m looking forward to the balance. Kitt – Hehe, the mise en place does take some getting used to. I probably should have clarified that it was more than one culinary mishap that forced me to start developing my mise-habits. Now it’s hard to imagine cooking without it. Thanks, Micha! I think it’s going to really hit me hard when December comes around and I don’t have a month off to relax and have time for myself. Querida Núria, muchas gracias por tus comentarios 🙂 hehe, I started cooking for real when I got to college, but I’ve been around food my entire life. haha, the crazy nights never leave you!! Thanks for the blogger-pardon, Adam 🙂 The gym is what keeps me going most of the days. I feel lazy before I go, but I’m over the place and pumped by the time I get out. haha, sounds FANTASTIC, Meeta!! I feel like this season is gonna be a good one, too!! I hear what your saying about the “real” world often after students leave campus. It definitely takes some getting used to! love, love, love house… i get hooked and cannot tear myself away. as for setting up a mise, i always do it. it makes me better organized and it’s alot easier to cook because there is always a little sous chef that comes and interupts when i’m cooking dinner. as for being busy… wait until you decide to have kids, it brings up the busy level to crazy busy! This is one of the best pork dishes I’ve seen for some time – fantastic! I find blogging goes in phases – sometime life just gets in the way (at the moment I barely have time to check my email, never mind post 5 times a week!) But I know it’ll get back to normal soon – it’s all about the routine! I don’t know why I have been postponing using figs as cooking ingredient. Okay so, maybe I just have this fear of messing it up. But oh look at that cheese and figs combo!! I loveee blue cheese on everything! So I should just get over my fear on using figs as cooking ingredients! I have not blog as often either, between work and dance and oh..LIFE in general – I am dead tired by the time I hit home. Now that is the way to serve / make pork.. OMG off the charts amazing looking and I am sure the flavors are equally as amazing. Thanks for this kick as culinary creation. I will make this one for sure. I have to make this. Looks absolutely spectacular! I like the combination here! Lovely, lovely meal.